South Africa is currently very good value for money for tourists. And made cheaper yet because of the current favourable exchange rate. Last time I looked, you got R15 for each £1 (or about R10 for each US$1). 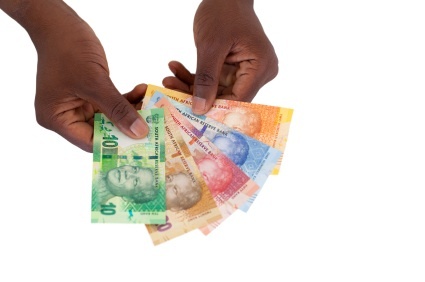 What is cheap in South Africa? Petrol – on average petrol costs less than 90p per litre. Clothes – clothes are cheap on the whole (excluding international brands!) especially if you buy from some of the discount stores in the retail parks. Accommodation – there is a large range of accommodation in South Africa, but overall cheaper and better quality and service than you’d get for a similar price in Europe. Entertainment – tickets for bands / shows are about 50% -100% cheaper in South Africa than in Europe. All of the above is great news for tourists and the largest part of your expenses whilst in South Africa would be from these categories. And as VAT is only 14%, it doesn’t bump up the price either. What things are expensive in South Africa? Broadband – extortionate! Firstly many areas can’t get fast broadband at all, but if can get it, you pay through your nose. For a service that costs about £16/month in the UK, you pay about £150/month in South Africa. Cars – even second hand cars are expensive. We’ve just paid R40k (£2.6k) for a 9-year old run-around Corsa. One of these would cost about £500-£1k in the UK. Electricity – houses are bigger than in the UK, but as there is no gas/central heating etc, electricity is used for everything. And bills are really high! Technology – anything imported is expensive. And there is no Amazon to drive competition, so they pay 20% – 100% more for most goods. Medical – there is no NHS (National Health Service) equivalent in South Africa, so residents generally rely on private medical, which is expensive. School fees – no free schooling in South Africa. Good schooling costs (a lot of!) money. There are already a number of South African and UK prices in their database. 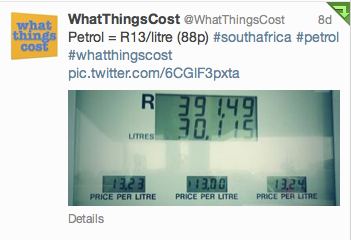 Tim and I will be keeping you up-to-date with the cost of things by submitting prices to @WhatThingsCost. Help them with prices around you too. So next time people talk about how cheap everything is in South Africa – they are right of course – many things are cheap and especially for those visiting. Get on the internet, check out the flights, get that holiday booked – it is still one of the best holiday destinations about. But spare a thought for the locals who earn considerably less than you do, as their every day real life expenses rack up quickly. Next time you complain about how prices have increased, rather count yourself lucky!